Trade show and educational sessions will open on Tuesday, February 9, at the Harrah’s Resort & Waterfront Conference Center in Atlantic City, New Jersey. The show will feature exhibits and displays from many of the industry’s suppliers and business associates. This year, the educational program features twenty-five sessions, including an all-day Farm Food Safety training session and Basil Workshop Session. Start 2016 off right: learn from the best, touch base with fellow growers, and earn re-certification credits, all in three jam-packed days. Daily passes for the trade show and educational sessions are available for $50 a person. NJ Vegetable Grower Association memberships are $100 for 2 people who may attend the trade show and educational sessions all day/every day. Click the Information & Registration link above for more information on hotel and meal reservations. Members receive the comprehensive 2016 Commercial Vegetable Production Recommendations. In addition, the 2016 State Agricultural Convention will open with its regular business session on Wednesday, February 10, and continue on Thursday, February 11, 2016. The meeting will focus on developing and setting a policy agenda for the industry over the coming year through the resolutions process. The listening sessions, during which members of the agricultural industry can provide on-the-ground experiences and ideas for policy, will also be an important part of the convention. This year’s listening sessions will highlight Locally Grown, as well as feature an Agricultural Agents Micro Speed Session, where county agents will provide an update on their current projects. 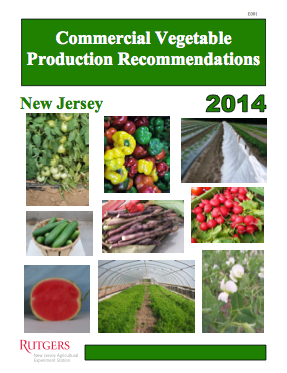 The new 2015 Commercial Vegetable Production Recommendations guide is now available. At NJAES, we are proud collaborators in the pursuit of evidence-based, environmentally-sound agricultural practices. 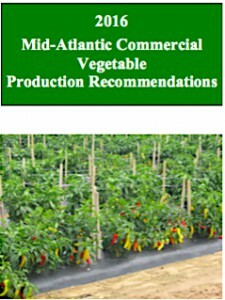 We sometimes refer to the Recommendations as the $50-million growers guide because of the cumulative effort, scientific wisdom, and practical experience found within its pages; make no mistake, its a stunning return on investment for anyone who grows or eats vegetables in the mid-Atlantic states (Rabin did the math). Or, contact your local Rutgers Cooperative Extension Office. During the weeks of May 13-17 and June 3-7, the NJDEP Pesticide Control Compliance and Enforcement will be conducting inspections of NJ farmers who currently or previously reported using soil fumigants, primarily Vapam (metham sodium). There are about 50 NJ farms reporting fumigant use. These farms will be the targets of the compliance assistance inspections. The inspections are being conducted by NJDEP as non-citation “compliance assistance” in response to changing regulations from US EPA for assuring safety of fumigant application workers by licensed applicator farmers.